While reading Urban Informatics (Foth, 2009) I came across an interesting article by Nakanishi et al. (2009) entitled “Virtual Cities for Simulating Smart Urban Public Spaces” which explores the use of virtual cities as a test bed for examining the design of urban public spaces. 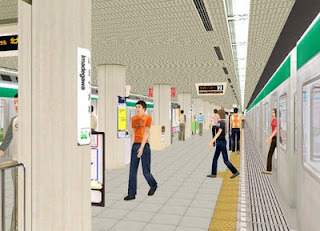 Specifically the authors combine an agent-based model with a virtual city model (in this case a platform at the Kyoto subway station) and used augmented reality to allow humans to interact with the agents (as if the agents and the humans where in the same crowd) through the use of positioning sensors around the station and then simulated an emergency. Further information about the project, including the software Freewalk where humans and agents can socially interact with one another in a virtual city space can be found here. Foth, M. (2009), Handbook of Research on Urban Informatics: The Practice and Promise of the Real-Time City, IGI Global, Hershey, PA.
Nakanishi, H., Ishida, T. and Koizumi, S. (2009), 'Virtual Cities for Simulating Smart Urban Public Spaces', in Foth, M. (ed.) Handbook of Research on Urban Informatics: The Practice and Promise of the Real-Time City, IGI Global, Hershey, PA, pp. 257-269.